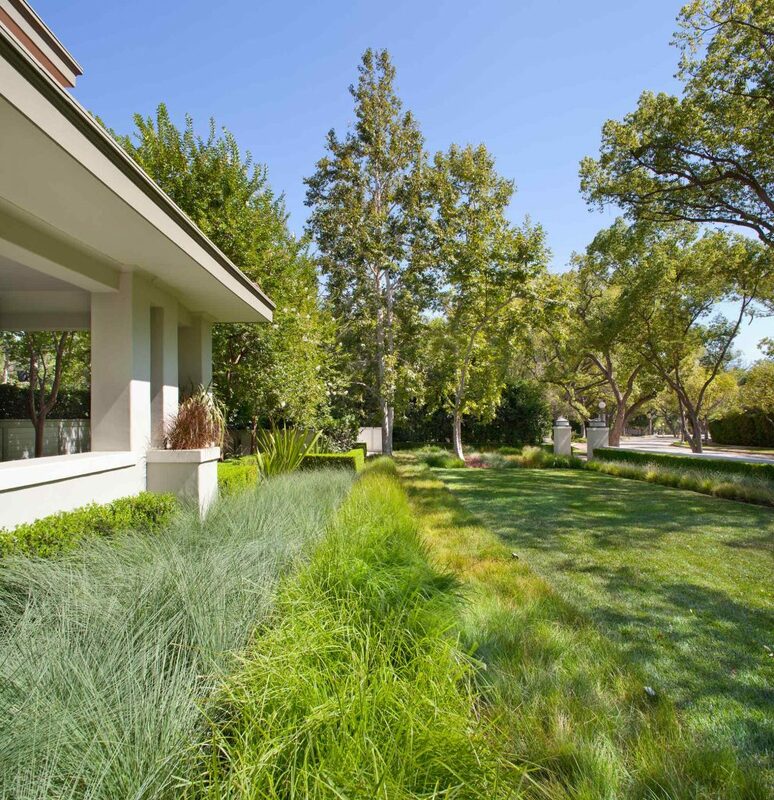 The California drought of 2011-16 instigated a rethinking of the large swaths of lawn at the Pasadena Residence, a property we have revisited multiple times over the years for these longtime clients. For the latest transformation, water use was top of mind. 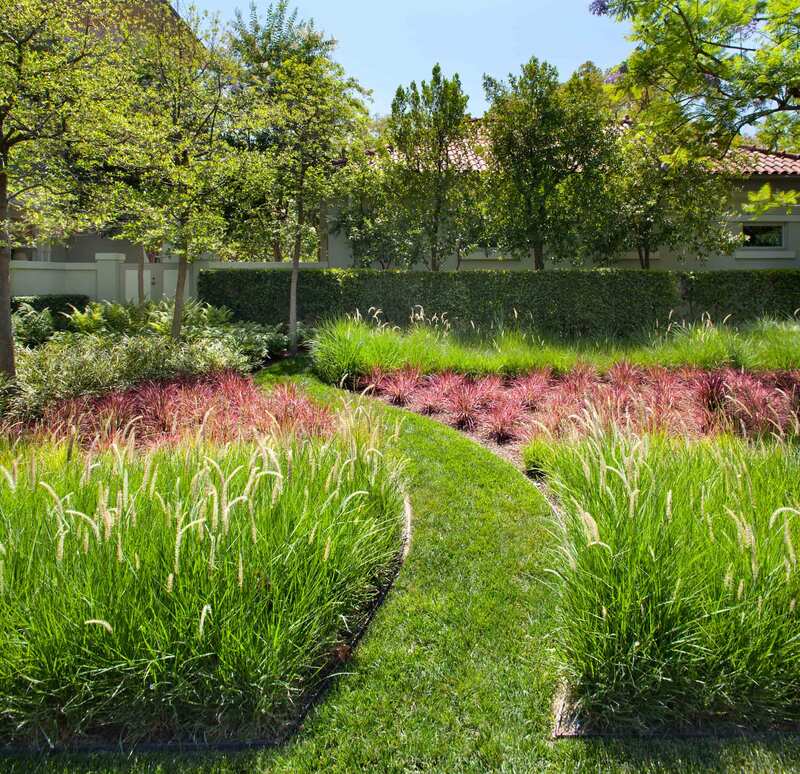 We used a myriad of drought-tolerant plant alternatives to achieve a 50% reduction in the total amount of lawn area, reducing it from 18,400 square feet to 9,244 square feet. The design demonstrates that beautiful, colorful, and verdant surroundings that still respect the environment are possible, even in the most severe dry periods. Around the pool we replaced lawn with California Field Sedge (Carex praegracilis) and fountain grass (Pennisetum Massaicum). 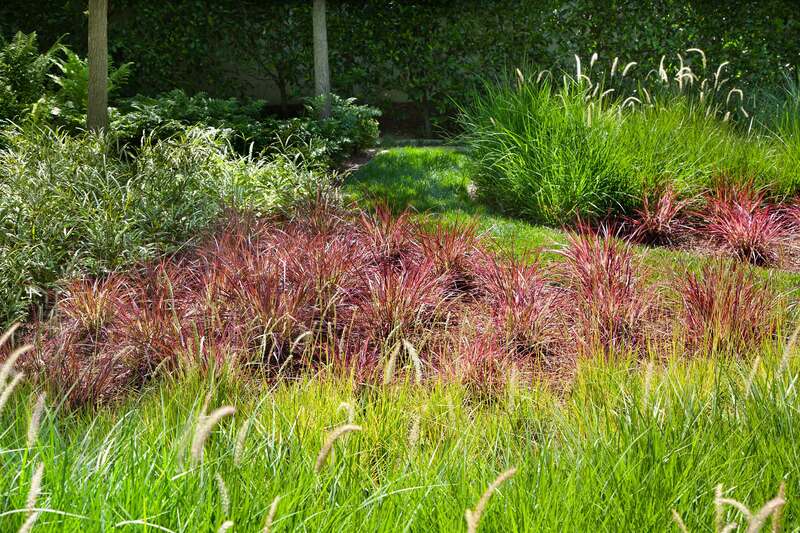 In the front of the house, we substituted native meadow grasses like Lindheimer’s muhly (Muhlenbergia Lindheimeri), and autumn moor grass (Sesleria autumnalis). 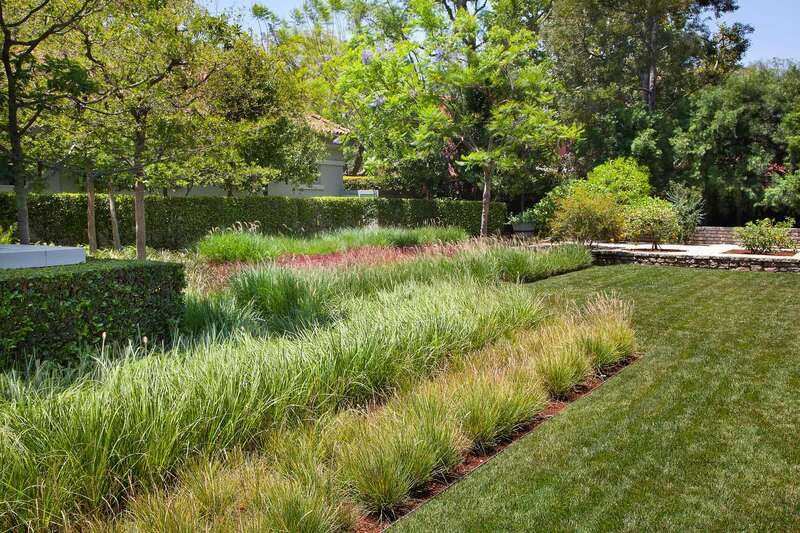 The entire yard remains planted and verdant, but the water use is significantly reduced. Adding a vegetable garden in custom-designed planters allowed us to remove even more turf and allows the client to grow crops of vegetables and leafy greens in both summer and winter. 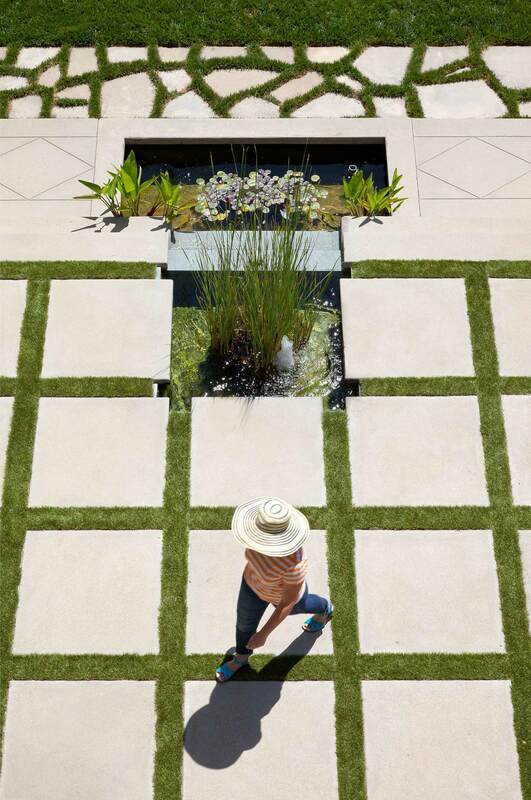 On the home’s two patios, we alternated strips of artificial turf with poured concrete pads, creating an inviting walking surface and framed gathering spaces. We also upgraded the irrigation system’s drip lines, sprinkler heads, and control system to technology that is state of the art in its water efficiency. The result: a 31% reduction in water use over the first 10 months, which will continue to lessen as the new plant materials become established. We originally designed this residential landscape in 1997 to create more indoor and outdoor space for the clients. We enclosed the back porch, which contained a 1907 scored concrete floor, to create a glass lined gallery. 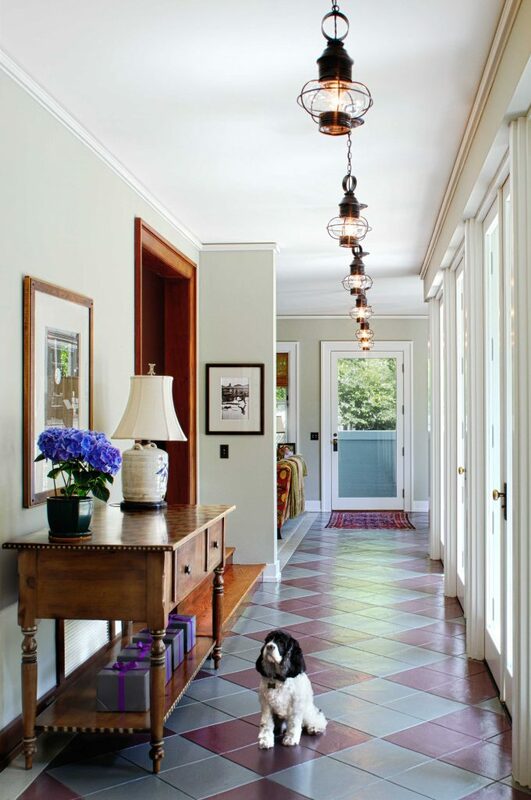 The floor is stained in purple and green colors which tie to the slate used in the fountain, pool, and mosaic dining table in the loggia. 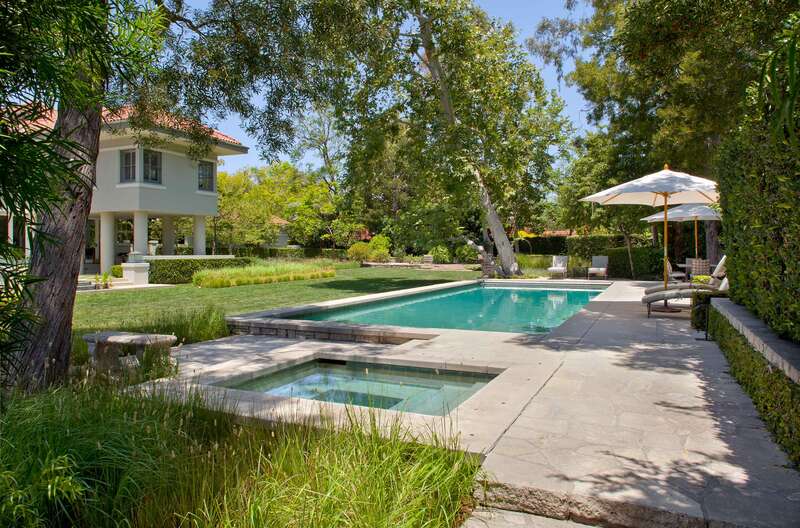 In 2002, the owner purchased the adjacent lot and added a sports court, an outdoor patio, and a fountain to the property, as well as a series of outdoor spaces that sequence the new additions. 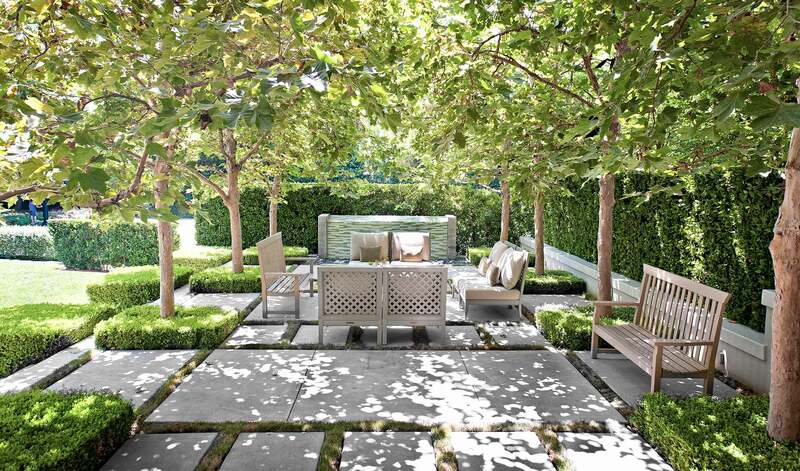 A long swath of lawn at the back takes best of advantage of the size of the property, while packing in zones of specialty gardens on either side. Cutting gardens, vegetable beds, orchards and herb gardens are accessible from the house side of the lawn. Meandering paths through hedges and shrubs provide a place go, discover and get lost on the far side of the lawn. 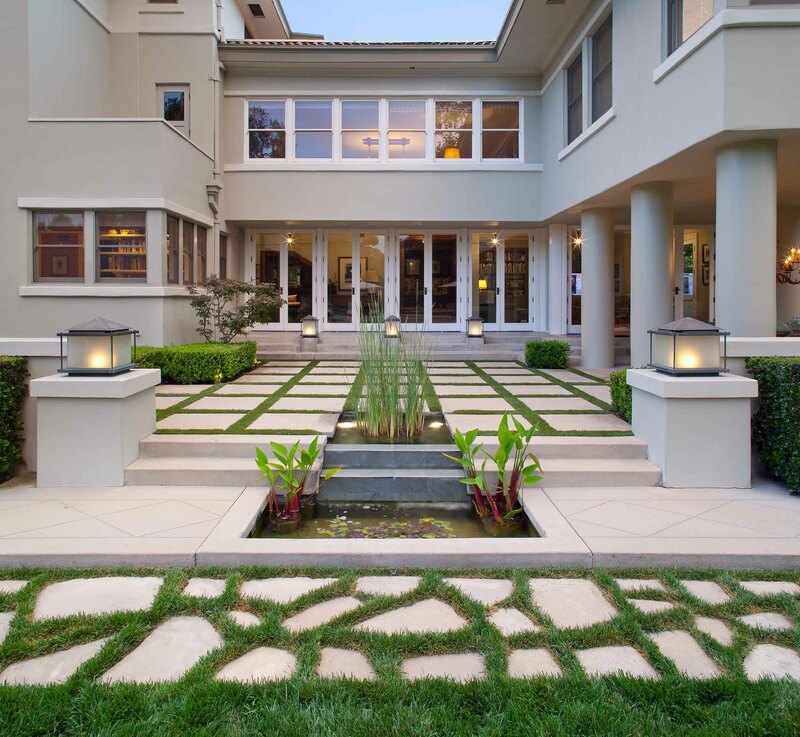 At the rear of the house poured-in-place concrete pavers, aligned with geometrical precision, draw visitors to a bubbling “pond.” Steps on either side lead down to the lawn and swimming pool beyond. 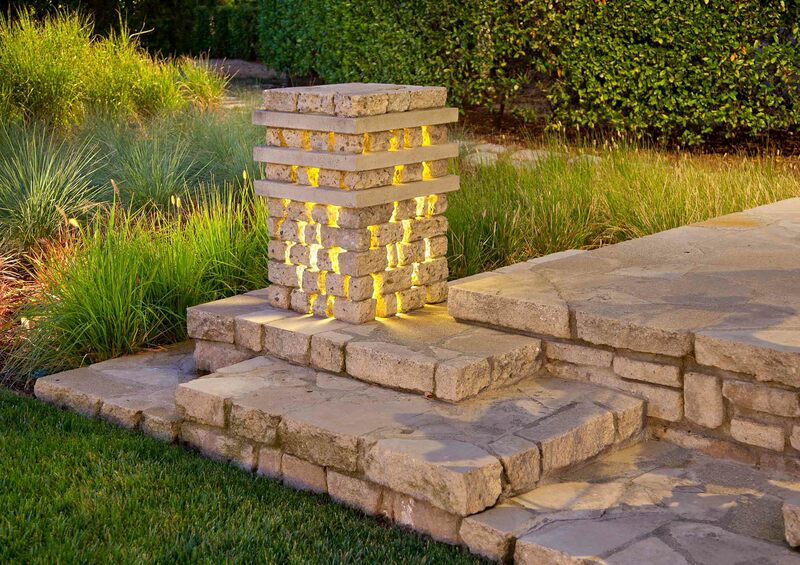 The stacked, broken concrete lanterns were designed by Rios Clementi Hale to suit the large scale of the house and gardens. Large mature sycamore, crape myrtles, Chinese fringe trees and London plane trees give the 1½ acre property an expansive, park-like look. 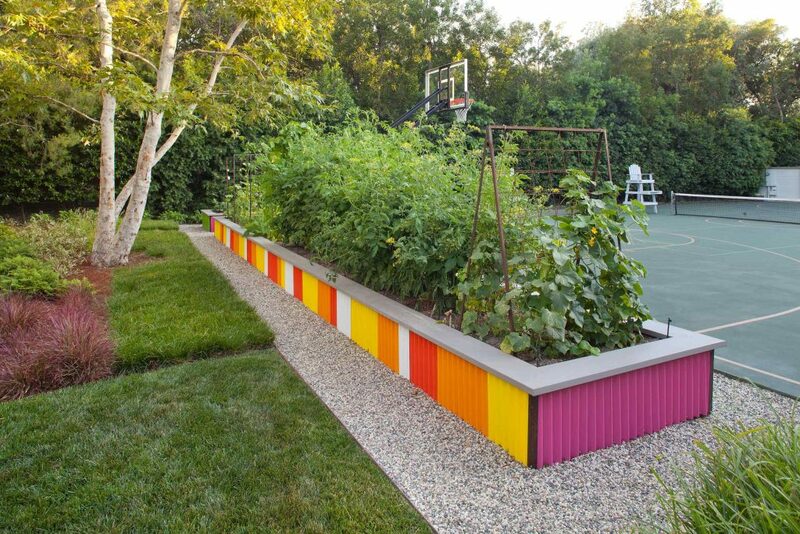 The grounds also include rose gardens, a raised vegetable garden with fruit trees, and an outdoor kitchen. 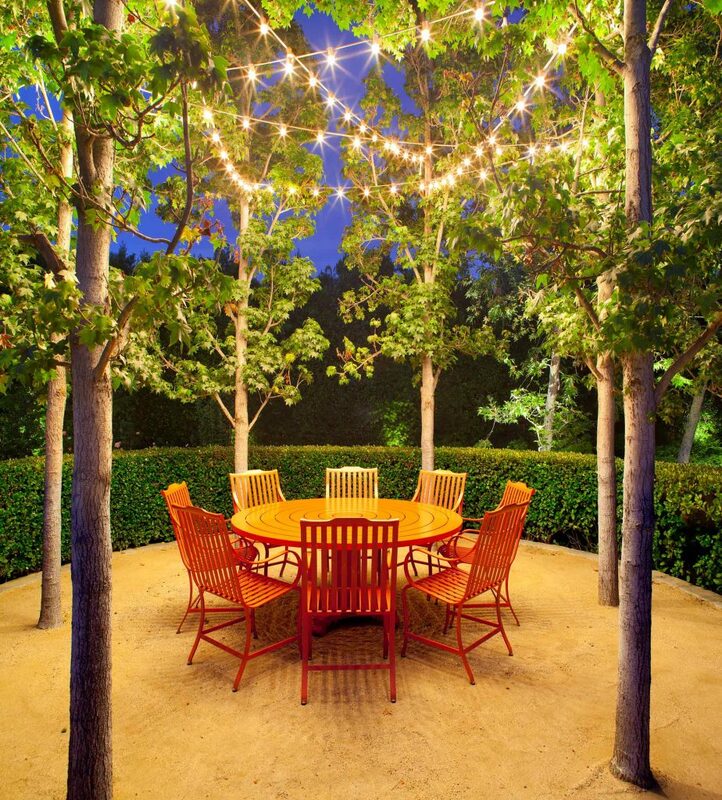 In the raised dining area, a circular hedge creates a round room lined with liquidambar trees strung with lights, a decomposed granite “floor,” and filled with a rust red table and chairs that anticipate the trees’ fall show. Credit goes to the owners, who are passionate gardeners and proactive in accounting for their water consumption. Over the years, the landscape has developed into a collection of outdoor rooms and plant species that are both performative and experimental. 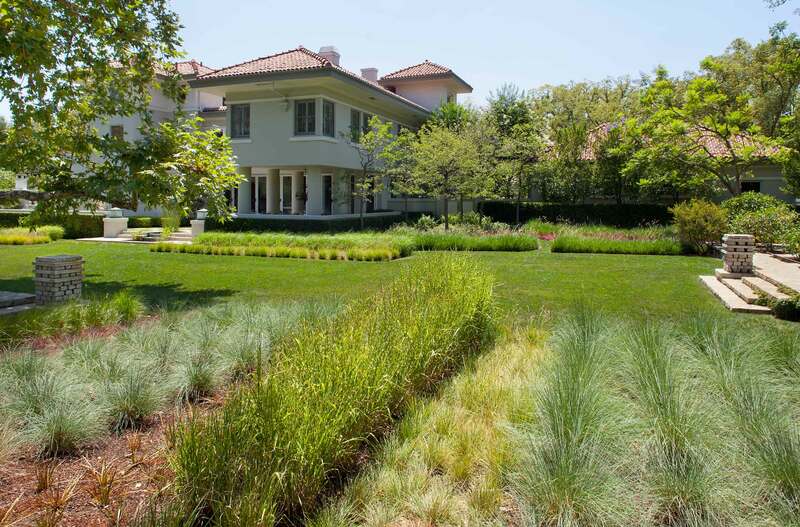 The gardens are a personal expression of our shared commitment to landscape stewardship.